Jean Evans Osterheld, 91, of North Little Rock passed away Thursday, July 12, 2018. She was born June 6, 1927 in Johnstown, PA to Laighton and Martha Evans. Jean was a wife, mother, and educator. She received her Bachelor's from Wheaton College and earned her Master's at Cornell University where she met and married her husband. They moved to Montana in 1952 where they ranched and raised their family. 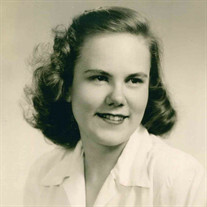 Jean taught chemistry and was a school librarian as well as an active member of the Florence-Carlton Community Church. Jean is survived by her four sons, Bob Osterheld, Al Osterheld, Jim Osterheld, and Tom Osterheld; and three daughters-in-law, Carol Osterheld, Myrna Osterheld and Claudia Osterheld; and two grandchildren, Keith and Celeste Osterheld as well as dear friend, Florence Cuspao. Jean was preceded in death by her parents; husband, Robert Keith Osterheld and brother, Richard Evans. A visitation will be from 2:30 to 3:00 p.m., Saturday, July 14, 2018 followed by a service of remembrance at 3:00 p.m., at Smith - North Little Rock Funeral Home. Service and interment in Florence-Carlton Church and Cemetery will be held at a later date in Florence, Montana.